A recent post in Atlas Obscura on the man who wants to make eating shad a fad again brought to mind this splendid book by John McPhee and a review of it I wrote back in 2003 for the late, lamented Readerville.com. I am a major fan of this writer, and am convinced that his shopping lists are writings of surpassing elegance and interest. It was published by Farrar, Straus and Giroux (September 10, 2003), it’s apparently still in print. This, for you, is very good news indeed. A 0-1,000-hertz hydrophone is so sensitive that it can hear sand grains in motion, even in very quietly moving water … A relaxing and soothing sound, not unlike the recorded surf played above the cribs of infants, it was audible geomorphology — you were listening to mountains on their way to the sea. Many of McPhee’s elegant discourses were published in The New Yorker in its heyday. Finding his name in the Table of Contents always brought a jolt of pleasure, especially if the article’s title indicated that it was just part one of what was to come. In these lesser days his name has appeared infrequently: editorial styles have changed, the long, multipart nonfiction piece appears to have been put aside in favor of shorter, punchier articles. I thought perhaps McPhee had hung it up, retired from this traveling and writing business, and that no new McPhees would be forthcoming. I am delighted that I was wrong. That McPhee is a fisherman is something I had gathered from his earlier writings. 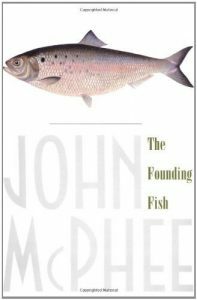 I did not know the extent of the malady until I opened the pages of The Founding Fish. In particular he fishes for shad, the subject that gives this book its name. But wait a minute. In my youth I fished for trout in the cold, clear waters of the High Sierra, but was never very good at it. (What fish I caught sacrificed themselves to me more out of pity, I think, than through any skill of mine.) I like to eat fish. I keep tropical specimens and enjoy visiting aquaria. But that’s about it. My interest in reading about fishing for shad is just about nil. Still, I have learned over the years to trust John McPhee. My trust has not been misplaced. Anadromous fish have suffered at the hands of western Europeans in America, from the damming of their spawning rivers (as far back as the 18th century) to such fierce pollution that long sections of rivers have been effectively stripped of life. McPhee shows us that, along with the heartening effects of the 1972 Clean Water Act and the even more heartening push toward the destruction of dams in American rivers. We visit the Bay of Fundy, where young shad spend summers feasting on zooplankton; we spend time in Florida at the southern border of shad territory; and we visit the vigorous descendants of the shad who were lovingly hand-carried across the country and seeded in western waters in 1871 by Seth Green of the New York Fish Commission. At the turn of the last century, shad were perhaps the most eaten fish in America. “It may safely be said that the veritable king of food fishes is a denizen of our waters, for there is probably no fish on earth that surpasses the shad in all the qualities that go to make up an ideal food fish,” said Charles Minor Blackford of Virginia in 1916. But the shad’s popularity, McPhee tells us, has fallen. He ascribes this, in part, to the fact that the shad is a particularly bony fish, and remembers his grandfather saying to his cousin Billy, who hated shad, “The density of thy ignorance is appalling, child. Don’t worry about the bones. Forget them. The fish is good.” But it appears that Billy’s dislike presaged a general downturn in American regard for the shad. This has not lessened my desire, next spring, to search out a shad and eat it. Look, I’ll be honest with you: I am about 50 pages from the end of the book and reading with increasing slowness. I don’t want it to end. I have, on my shelves, six books by John McPhee that I haven’t read and resist reading. They are my emergency fund, saved for that proverbial rainy day when life is bleak and American arts and letters have gone to hell in a handbasket. When that day comes, I will reach for one of those six, and sink into a vigorous and literate world that here on the outside, I don’t even know exists.